A sandwich is pretty much the perfect weeknight meal — they're fast, easy to make (...and eat!) and satisfying. To celebrate sandwich makers everywhere, King’s Hawaiian is sponsoring the My Ultimate KING’S HAWAIIAN Sandwich Challenge. The goal: to find the most mouth-watering and delicious sandwiches from around the country and share those recipes online for everyone to enjoy. King’s Hawaiian recently sent me a sampler pack of their sweetly delicious bread products to create an entry for the contest and share it with you. I opted to use their hamburger buns to create a fun, Asian-tropic fusion burger that has layers of spicy and sweet flavors! There are fewer things I love more than a good burger, but I can easily fall into a rut of making classic all-American cheeseburgers. Not that it's not a delicious option, but I also love to create fun burgers with an unexpected spin or two. The sweet flavor of King’s Hawaiian hamburger buns was the inspiration for my Asian-Pacific Burgers. Flavored with Asian spices and topped with grilled pineapple, sauteed sweet Maui onions and creamy avocado, they’re a fun spin on the classic burger. A sweet and spicy flavor is provided by including honey-mustard and a double shot of Thai stir-fry sauce in the burger mixture and brushed on top as the burgers cook. This flavorful burger’s like a tropical vacation, but without the expensive plane tickets and crowded beaches! These burgers can be made outdoors on the grill, or they can be whipped up using an indoor grill pan. They're sweet, savory and a little spicy...and all around good! 1. Add the beef, onions, feta, cilantro, Asian spice blend, ½ cup of the stir fry sauce and salt & pepper in a mixing bowl. Using pristinely clean hands, mix the ingredients and form into four patties. 2. Heat a grill pan over med-high heat until hot. Spray with non-stick spray and add the burger patties. Cook for 3 minutes, until seared. Flip and spread with 1 tbs. of the remaining stir fry sauce. After 3 minutes, flip again and spread the other side of the burgers with an additional tbs. of the stir fry sauce. Reduce heat to low to keep the patties warm. 3. Add the olive oil to a small non-stick skillet over med-high heat. Add the sliced onion and cook until golden, about 5 minutes. Remove from pan and add the pineapple rings. Cook until browned, about 2-3 minutes per side. Toast the King’s Hawaiian hamburger buns. 4. To assemble the burgers, place one patty on top of the bottom half of each bun. Layer the grilled pineapple rings, sautéed onions and sliced avocado on top of the patties. Spread the honey mustard on the top bun and serve. These burgers are so good: a little spicy…and a little sweet. The sweet Maui onion, juicy pineapple and honey mustard pair perfectly with the sweet Hawaiian bread. The Thai stir fry sauce adds a bit of spice, and the pockets of melty feta are a nice burst of salty goodness. We enjoyed these burgers with chips and lemonade for a great Summer dinner. I had never had pineapple on a burger, but it worked perfectly here. King’s Hawaiian is inviting everyone to share their favorite sandwich recipe by entering the My Ultimate KING’S HAWAIIAN Sandwich Challenge. Ten winning entries will be treated to a special night out on the town that includes limousine service and dinner for six at a featured restaurant – in addition to receiving a year’s supply of KING’S HAWAIIAN bread! The winners will also have their recipe shared online and in the media with sandwich lovers everywhere. Entering the contest is easy! Contestants simply upload their ultimate sandwich ingredients and recipe, along with a mouth-watering photo of their ultimate sandwich, at the contest website by 11:59 p.m. PST on September 2nd. 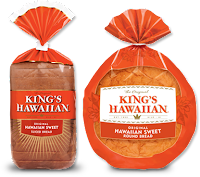 Each sandwich recipe must include the use of KING’S HAWAIIAN Original Hawaiian Sweet Sliced Bread OR any other KING’S HAWAIIAN bread product. All approved entries will be posted on the King’s Hawaiian website, and contestants are encouraged to share their sandwich creation with friends and family via their social media channels. Winners will be announced on September 17, 2013. Disclosure: King's Hawaiian sent me a sampler of their bread products for recipe creation and to facilitate this post. I received no other compensation, and all opinions expressed are my own.